This is the detailed narratives section of the website relating to Stuart's maternal and direct family. If you came here directly from a search engine it is recommended that you start at the home page of the Pask, Paske One-Name Study. If you have any additional information, and would like to contribute to these pages, please contact Stuart direct. [S669] Image of the 1841 Census for Deeping St. James, Lincolnshire: HO107 Piece 617 Folio 4 page 37. [S755] Image of the 1861 Census for Deeping St. James, Lincolnshire: RG9 Piece 2319 Folio 69 Page 6. [S756] Image of the 1861 Census for Deeping St. James, Lincolnshire: RG9 Piece 2319 Folio 70 Page 7. [S1045] Website Website: FreeREG (http://freereg.rootsweb.com). [S447] Website Ancestry Civil Registration (http://www.ancestry.co.uk/search/rectype/vital/freebmd/…) : 1848/Q4 Bourne 14 527. [S761] Website Lincolnshire 1837-1850 Marriage Indexes (http://s10.freefronthost.com/mi/). [S757] Image of the 1851 Census for Deeping St. James, Lincolnshire: HO 107 Piece 2095 Folio 703 Page 6. [S758] Image of the 1871 Census for Deeping St. James, Lincolnshire: RG10 Piece 3317 Folio 40 Page 7. [S760] Image of the 1881 Census for Deeping St. James, Lincolnshire: RG11 Piece 3199 Folio 46 Page 22. [S27] National Burial Index (NBI). 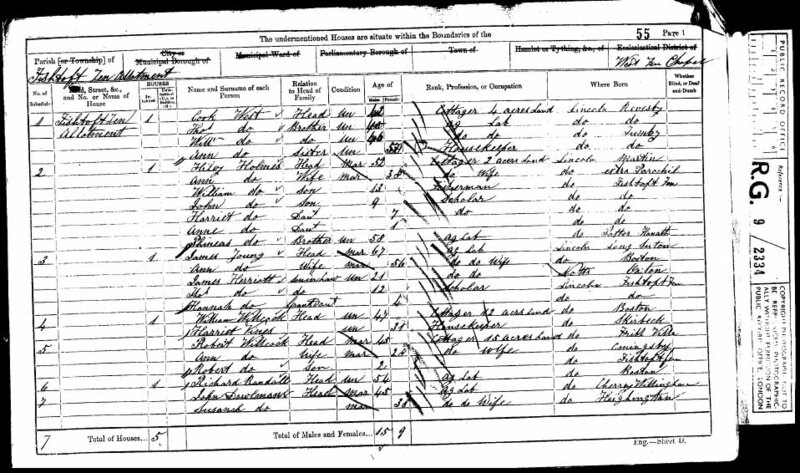 [S759] Image of the 1891 Census for Deeping St. James, Lincolnshire: RG12 Piece 2558 Folio 32 Page 5. [S448] Website Ancestry Civil Registration (http://www.ancestry.co.uk/search/rectype/vital/freebmd/…) : 1898/Q3 Peterborough 3b 151. [S670] Letter from John Cooper to Stuart Pask, dated 9 December 1990. [S1149] Website LINCS to the past (http://www.lincstothepast.com) : Great Steeping 1776-1781 image 6. [S151] The Church of the Jesus Christ of Latter-Day Saints, Vital Records Index, Second Edition: FHL Film 1542178. [S672] Baptisms, Marriages & Burials Transcript, Little Steeping, Lincolnshire ."http://www.lincstothepast.com/Records/…." [S1047] Baptisms, Marriages & Burials Transcript, PR:Great Steeping, Lincolnshire. [S1048] Image of the 1841 Census for Halton Holegate, Lincolnshire: HO107 Piece 636 Folio 11 Page 12-17. [S1049] Image of the 1851 Census for East Keal, Lincolnshire: HO 107 Piece 2109 Folio 375 Page 17. [S448] Website Ancestry Civil Registration (http://www.ancestry.co.uk/search/rectype/vital/freebmd/…) : 1856/Q3 Spilsby 7a 284. [S672] Baptisms, Marriages & Burials Transcript, Little Steeping, Lincolnshire. [S1149] Website LINCS to the past (http://www.lincstothepast.com). [S1149] Website LINCS to the past (http://www.lincstothepast.com) : Great Steeping 1773-1774. Thomas married Anne Howton on 1 May 1710 in Scremby, Lincolnshire. [S120] Baptisms, Marriages & Burials Transcript, Spilsby, Lincolnshire . "John Cooper Spilsby Research." [S674] Image of the 1841 Census for Spilsby, Lincolnshire: HO107 Piece 644 Folio 18 Page 9. [S448] Website Ancestry Civil Registration (http://www.ancestry.co.uk/search/rectype/vital/freebmd/…). [S495] Copy of the marriage certificate of Abraham Peck and Jane Bogg, 19 March 1848. [S3] GRO Indexes to Marriages, "1848/Q1 Spilsby14 786." [S750] Image of the 1851 Census for Spilsby, Lincolnshire: HO 107 Piece 2109 Folio 388 Page 4. [S448] Website Ancestry Civil Registration (http://www.ancestry.co.uk/search/rectype/vital/freebmd/…) : 1858/Q3 Spilsby 7a 323. [S27] National Burial Index (NBI), 1858/Q3 Spilsby. [S748] Image of the 1851 Census for Spilsby, Lincolnshire: HO 107 Piece 2109 Folio 422 Page 37. [S680] Image of the 1861 Census for Spilsby, Lincolnshire: RG9 Piece 2375 Folio 37 Page 1. [S671] Image of the 1871 Census for Spilsby, Lincolnshire: RG10 Piece 3392 Folio 25 Page 5. [S448] Website Ancestry Civil Registration (http://www.ancestry.co.uk/search/rectype/vital/freebmd/…) : 1879/Q2 Spilsby 7a 379. [S1041] Unknown subject, Lincolnshire Inquest Records. [S1041] Unknown subject, Lincolnshire Inquest Records, 24 May 1879 Spilsby, St James. [S437] Baptisms, Marriages & Burials Transcript, Halton Holegate, Lincolnshire . "Searched Baptisms 1813 < 1869 1 December 1983 L.A.O." [S802] Image of the 1841 Census for St. Martin, Lincoln, Lincolnshire: HO107 Piece 651 Folio 9 Page 29. [S763] E-mail from John Cooper to Stuart Pask. [S710] Image of the 1861 Census for St. Michael, Lincoln, Lincolnshire: RG9 Piece 2361 Folio 80 Page 5. [S763] E-mail from John Cooper to Stuart Pask dated 22 May 2005. [S711] Image of the 1871 Census for St. Michael, Lincoln, Lincolnshire: RG10 Piece 3373 Folio 120 Page 3. [S712] Image of the 1881 Census for St. Michael,Lincoln,Lincolnshire: RG11 Piece 3243 Folio 133 Page 3. [S448] Website Ancestry Civil Registration (http://www.ancestry.co.uk/search/rectype/vital/freebmd/…) : 1882/Q2 Lincoln 7a 297. [S27] National Burial Index (NBI), 1882. [S988] Unknown author, unknown record type. [S830] Image of the 1841 Census for Leverton, Lincolnshire: HO107 Piece 609 Folio 3 Page 9. [S814] Image of the 1851 Census for Leverton, Lincolnshire: HO 107 Piece 2098 Folio 311 Page 4. [S1080] Image of the 1861 Census for Leverton, Lincolnshire: RG9 Piece 2332 Folio 97 Page 7. [S1081] Image of the 1871 Census for Leverton, Lincolnshire: RG10 Piece 3336 Folio 30 Page 4. [S448] Website Ancestry Civil Registration (http://www.ancestry.co.uk/search/rectype/vital/freebmd/…) : 1874/Q4 Boston 7a 366. [S890] International Genealogical Index (IGI). [S448] Website Ancestry Civil Registration (http://www.ancestry.co.uk/search/rectype/vital/freebmd/…) : 1842/Q2 Spilsby 14 369. [S464] Image of the 1841 Census for Spilsby, Lincolnshire: HO107 Piece 644 Folio 18 Page 34. [S679] Image of the 1871 Census for Boston, Lincolnshire: RG10 Piece 3341 Folio 73 Page 24. [S701] William White, White's 1856 Lincolnshire, Boston Page 311. [S702] Image of the 1861 Census for Boston, Lincolnshire: 1861 RG9 Piece 2337 Folio 70 Page 7. [S448] Website Ancestry Civil Registration (http://www.ancestry.co.uk/search/rectype/vital/freebmd/…) : 1876/Q4 Boston 7a 265. [S27] National Burial Index (NBI), 1876/Q1 Boston.